This milk is from cows not treated with rBST. North Coast Excellence certified. Free farmed. American Humane Association monitored. Grade A pasteurized. Homogenized. Vitamin D milk. 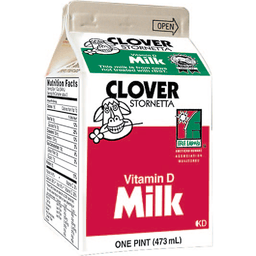 Clover Stornetta Farms was the first dairy in the United States awarded the Free Farmed label by the American Humane Association for humanely produced dairy products. Consumers are increasingly concerned about how farm animals are being treated. Clover has responded to their concerns. 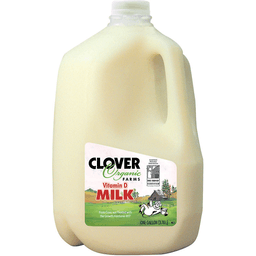 There isn't a milk pool in California that can match Clover's record: Spacious, local dairies with smaller herds. Families that are stewards of their farm lands. Extraordinary commitment to animal welfare: no feed-lot living. American Humane Association certified. All Clover producers have completed farm plans to implement sustainable farm practices. Top quality milk starts with excellent milk from the dairy farm. And no milk processor in the United States starts with a better quality milk supply than Clover Stornetta Farms - Pete Hardin - The Milkweed - Brooklyn, WI. This milk is from cows not treated with rBST. North Coast Excellence certified. Free farmed. American Humane Associate monitored. Grade A pasteurized. Homogenized. 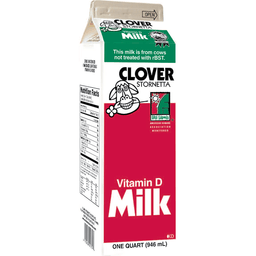 Vitamin D milk.